The azure waters of the Arabian Sea embracing the dazzling sands of Betalbatim beach is the inviting location of Nanu Resorts. 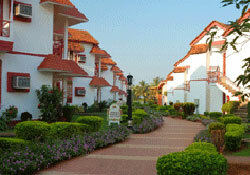 A luxurious beach paradise with a Goan ambience. Nanu Resort is just 18 kms. from Dabolim airport and a mere 7 kms. from Margao, the commercial center of Goa. Nanu Resort, a luxurious beach paradise with an authentic Goan ambience with natural lush green lawns, spread over swaying palms and the cool breeze of the Arabian Sea is at your convenience, closest by any means of transport. The beautiful cottage style accommodation offers 72 air conditioned rooms. Multi- cuisine restaurant and Exotic Cocktail Bar. The beautiful cottage style accommodation offers 72 air conditioned rooms. The rooms are spacious offering a panoramic view designed by blending the Goan and Portuguese styles.